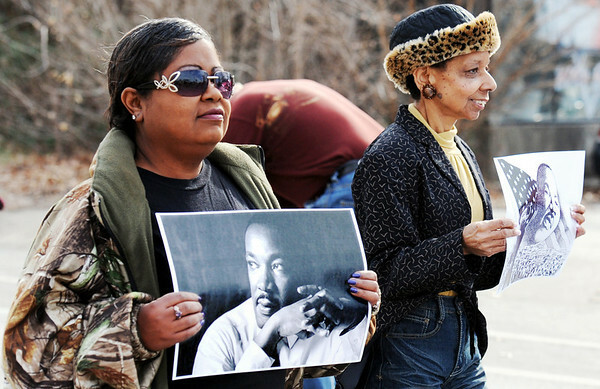 Locals, including Debbie Powell (left), of Joplin, who holds a photo of Martin Luther King Jr., and members of the Myrtle Lodge No. 149 participate in a parade honoring King's legacy Monday afternoon, Jan. 16, 2012, on Langston Hughes-Broadway in downtown Joplin. The parade, in honor of the civil rights leader, started at the intersection of Langston Hughes-Broadway and St. Louis Avenue and continued on to the Joplin Public Library.